We’re calling on animal lovers everywhere to email Google, asking their talented team to create a doodle for World Animal Day 2019! 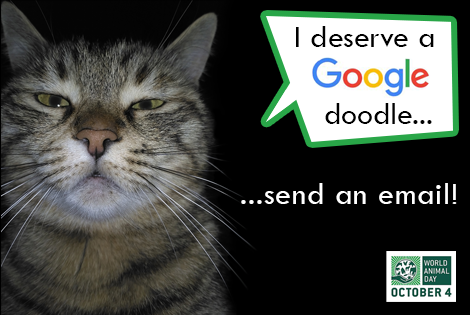 Some Google doodles are completed in a few hours, but others can take MONTHS to create, so please send your email TODAY! Every day, 205 BILLION emails are sent around the world - make yours count! The Mission of World Animal Day is to raise the status of animals and improve welfare standards. World Animal Day was pioneered by Heinrich Zimmerman, the German writer and publisher of the magazine Mensch und Hund, who organised the first celebration in 1925. It was held on October 4 for the first time in 1929. This special day is celebrated with an amazing variety of events in numerous countries, regardless of nationality, religion, faith or political ideology. Currently, there are 93 voluntary World Animal Day Ambassadors encouraging participation in 73 countries around the world. Read what some of them have to say about World Animal Day. The creation of a beautiful Goodle doodle will highlight this special day, raising global awareness of the plight of animals. The Google creative team receives hundreds of doodle requests every day. They might not respond directly to our emails, but wouldn't it be a fantastic surprise to wake up on October 4 and find a beautiful World Animal Day doodle on their home page?